- User Height Range: 4'10" to 6'6"
Voted by a panel of leading industry professionals as Winner of Most Innovative Product & Best New Retail Product! Don't add insult to your injury! Losing the use of a lower leg, foot, or ankle should not also mean losing the use of your hands and arms. Everyone knows that crutches hurt. They hurt your hands, your wrists, your underarms. They're exhausting to use. That's because your hands and arms were not designed for walking. That's what your legs are for. So why would you use an arm crutch when you could use a leg crutch instead? The iWALK 2.0 is a very simple, yet amazingly logical and helpful idea. With conventional crutches, you have to use your hands and arms to support your weight, making it difficult and inconvenient, if not impossible, to hold everyday items such as briefcases, grocery bags and a dog's leash. 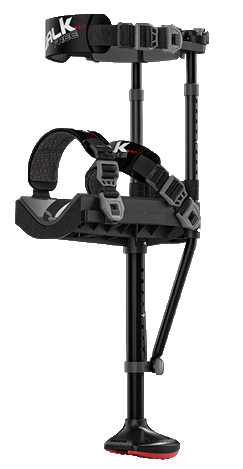 The iWALK 2.0 medical crutch uses the uninjured parts of your leg to support your weight when you stand or walk. In essence you kneel on the lower leg platform which bears most of your weight. Because of basic anatomy of the human body, you can comfortably kneel on your shin for extended periods without experiencing discomfort or fatigue. Get use of your hands back! Simply kneel on the knee platform and fasten the 3 straps around your thigh, knee and calf. The iWALK 2.0 is now a natural extension of your leg, and after a very short period getting used to it (under five minutes for most users), you'll be off and walking! The three straps cinch around your leg to stabilize you during standing and walking. Your hands and arms are not involved. It's a 'no-brainer'. If you have a lower leg injury, the iWALK2.0 Crutch is an easy-to-use tool for your lower leg rehabilitation. The most obvious benefit of the iWALK2.0 leg crutch in comparison to conventional crutches is that it is hands-free, so there is no interruption to your normal day-to-day routine. It may sound basic, but it is a freedom that conventional crutches or other crutch alternatives (such as knee scooters) cannot provide. In addition, iWALK 2.0 offers greater comfort. Conventional crutches put unnatural pressure on your hands and underarms, cause chafing and fatigue of your hands and arms. The iWALK 2.0 can end all of this unnecessary pain and discomfort. The iWALK 2.0 makes it possible to do things like walking the dog, cooking, making copies, opening a door, pushing a shopping cart - simple tasks that take on a whole new level of difficulty when you use conventional crutches. The ability to manage daily activities and remain independent can easily be taken for granted until you're faced with a leg injury. With the iWALK as your crutch alternative, you can live the lifestyle you did before your injury. No need to adjust your lifestyle for weeks or months as your injury heals. You can simply continue your typical routine. IS iWALK RIGHT FOR YOU? 1. Before your injury, could you walk without difficulty? 2. Is your injury to one leg only? 3. Is your injury below the knee? 4. Can you bend your injured leg 90 degrees at the knee? 5. Are you between 4'10" and 6'6"? 6. Are you under 275 pounds? 7. Is your upper thigh circumference (measured at the highest point of your thigh) 27" or less? If you answered yes to all of the questions above, iWalk is likely a good choice for you.